Since switching from biodiesel to renewable diesel, the Eugene Water & Electric Board (EWEB) in Oregon has reduced its fleet greenhouse gas emissions as well as maintenance on its diesel vehicles, according to the Oregon Department of Energy (ODOE). The agency began testing renewable diesel use in September, and now uses it on 85 of its diesel vehicles. Renewable diesel, like petroleum-based diesel, is made through a hydrogenation process instead of the chemical process used to create biodiesel, according to the agency. But unlike petroleum fuel, renewable diesel is a product of natural fats or vegetable oils, making it a cleaner, lower carbon content fuel option for diesel vehicles. In 2014, the the Eugene Water & Electric Board obtained a tax credit for installing an alternative fuel fueling station to run its fleet of vehicles. The station was designed to pump biodiesel, but ODOE thought EWEB could go even greener by using renewable diesel rather than biodiesel. Using a regular gallon of diesel fuel emits more than 30 lbs. of greenhouse gases into the air. Using a gallon of renewable diesel emits fewer than 10. EWEB is currently using about 6,100 gallons of renewable diesel each month. EWEB also discovered that renewable diesel is much easier on vehicle engines and diesel particulate filter systems. After making the switch, Lentsch noticed a significant decrease in maintenance issues. Renewable diesel is an emerging market, so ODOE and EWEB worked together to identify a local supplier. ODOE provides guidance to make sure production of the imported fuel doesn’t have other negative environmental effects, such as deforestation. Cities and municipalities across the northwest are already making the switch, including the City of Portland; Lane County Public Works; Clark County PUD in Washington; and more. 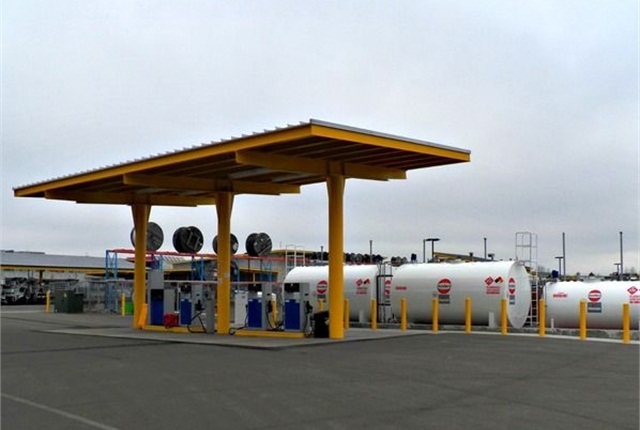 Oregon’s new Clean Fuels Program went into effect on Jan. 1, with the goal to reduce the carbon intensity of transportation fuels used in Oregon by 10% over the next ten years. Alternative fuels like renewable diesel will play a role in helping the state reach that goal.